our larvae, pupae, eggs and Mother Queen inside! so all breathe air, so all survive. We float this boat of bodies bobbing…BAM! and wait for rising rivers to recede. At last—the end of rain! it rises two feet high on a soggy field of grain. comes near our new terrain? 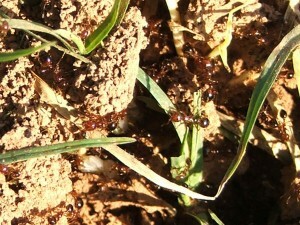 Fire ants are able to survive by creating a rotating ball, forming a protective sphere around the colony queen.